Maggotts, Becketts, Chapel. One of the best combinations of corners on any track in the UK and certainly one of the most testing. Get it right and it feels like you are propelled down Hangar Straight about to set the lap record. 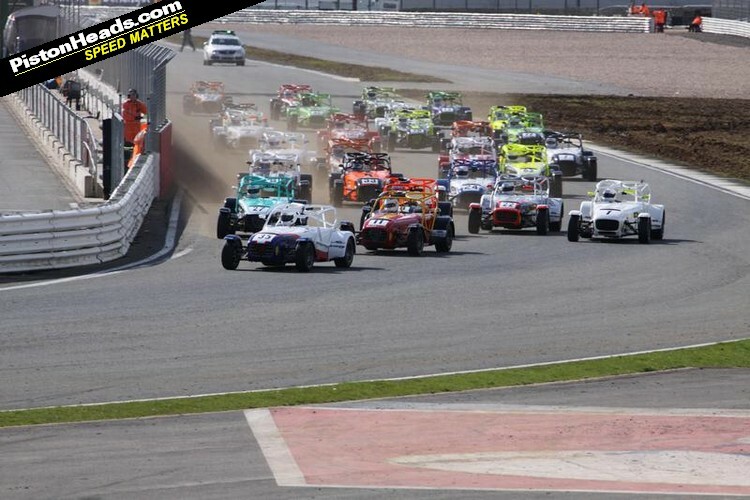 Get it wrong and you are struggling to find apexes and running out of road on exits from one corner to the next. 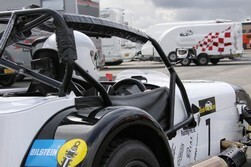 This is my first time on the Silverstone Grand Prix circuit and I am back in what I class as one of the best series in the UK, the BookaTrack.com Caterham Superlight R300 Championship. And this time the grid is sold out. 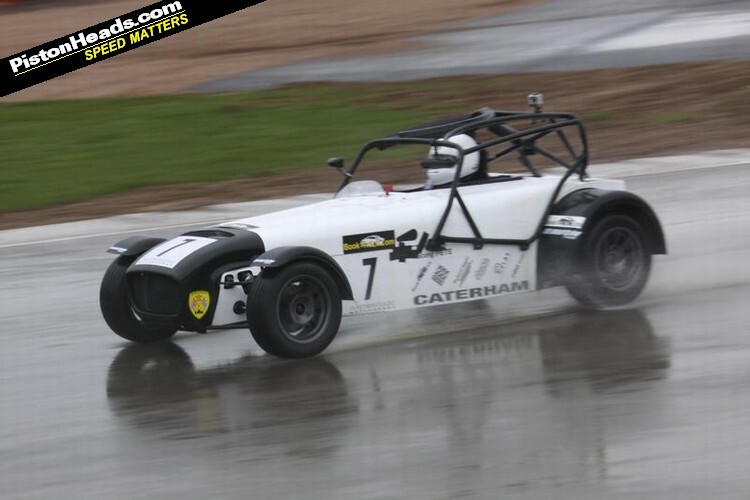 Not only are there now 32 cars starting this weekend, but this select bunch of racers - racing in the fastest and most powerful championship provided by Caterham - also have 13 championship titles between them. Four are current reigning champions, over half the grid has won a race and most of the rest have stood on a step of the podium. You could say that this is the most competitive championship in the country. 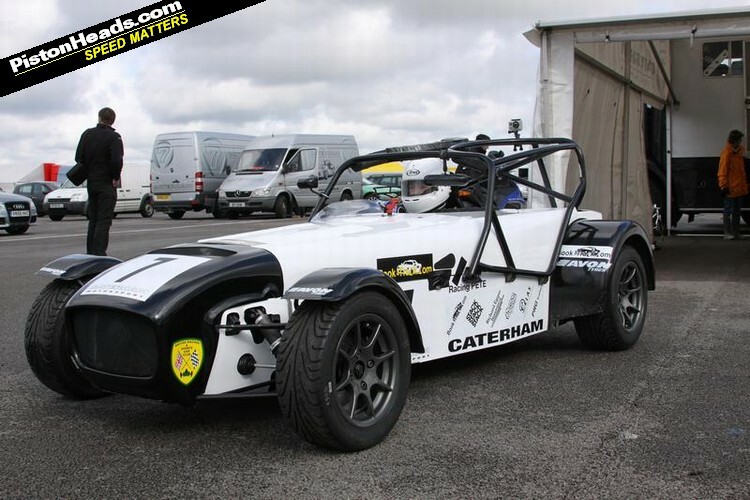 Unluckily for me the call to step into the Caterham came after any chance of pre-race testing - and the rest of the field already had a day's lappery around the GP Bridge circuit under their race seats. Although that sounds like I have started to quote from the book of racing excuses - found in the later chapters of the Motorsports Association Blue Book, just after the bit about how to use 'for sure' in interviews - it does make a difference when it comes to Caterham racing. Set-up is a key element to higher-level racing - jumping in a car and hoping to set a lap record is a big ask, even if your name is Jenson Button. The other key element is track knowledge, and some of the corners on the circuit I had driven many times, some I had driven once on my ARDS 12 years ago, and some no one had driven until the weekend, thanks to a little bit of circuit remodelling Silverstone had been doing over the winter. The most noticeable changes to Silverstone are on the southern part of the circuit. A reworked Club and the addition of a pit wall for the new South Circuit, though the pit straight has a different feel as the close grandstands have disappeared from the left hand side. This is all part of a development to allow three circuit configurations to be run at once, and the redesign for Moto GP. But the big sacrifice in this remodelling is the removal of one of the best and most gutsy corners in racing from most competitors' racing calendars: Bridge. This year it will be the first time Bridge, in its current guise, isn't used by the Formula One cars for 19 years; instead of turning left at Abbey the cars turn right into a new infield section heading back towards the top of the National Straight. Luckily it seems that all the racing clubs are taking advantage of this new layout and there are a number of events using the old Bridge circuit - which is the circuit I am about to drive for the first time. Sitting in the assembly area waiting for qualifying in April, in England, inevitably means April showers. As the clouds darken, my chance of a dry qualifying session and a chance to tune the car for a dry race are suddenly out the window as the sky opens and tips water onto the circuit. Race mechanics spring to action in the downpour and start swapping front wheels around - Avon says the control tyre works better the wrong way round in the dry - and detach anti-roll bars from the front of cars. I sit patiently in the car, watching the frantic action. The sun is starting to peer from behind the clouds and the rain has stopped meaning this will be a tricky drying qualifying session. 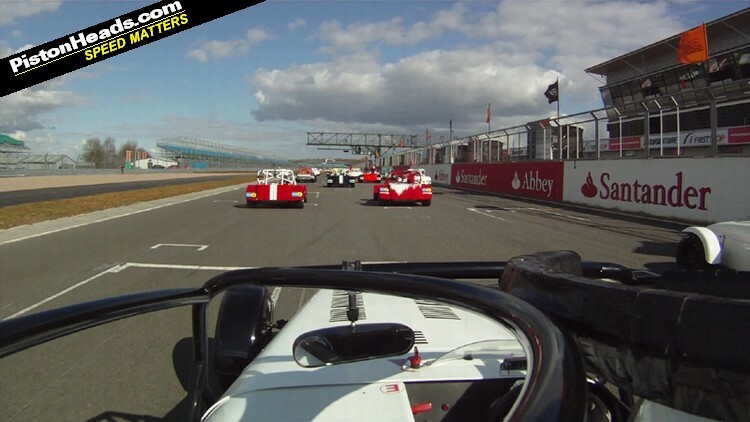 The whistle goes to signal the start and off onto a full lap of Silverstone I head. As I head round Luffield the removal of the grandstands give the track a completely different feel. Woodcote now has run-off on the left and Copse feels far more open and makes the braking point visuals much harder to spot. As I accelerate down towards Maggotts I think back to the circuit guide and the laps on the Xbox on how to tackle this combination. It should be flat through the first kink, holding on to the car hoping it grips again, down one gear and hug the kerb through Becketts, then a quick dab of the brakes and accelerate through Chapel onto a blistering lap time. That would be the method if it wasn't soaking wet - and Silverstone is a strange beast when it comes to its racing lines. For an incredibly wide track it has one of the narrowest racing lines and drifting even slightly off line leaves you stuck in marbles and dust - even more so with the redevelopment still ongoing - struggling to make an apex or turn-in. But come rain, suddenly this marble-strewn Tarmac is the grippiest place on the whole track; doing a wall of death around the outside of Luffield can gain you seconds on anyone still trying to drive the dry racing line. As I cross the line on the drying track and get the chequered flag first for the end of qualifying I realise the cars in front disappearing for another lap will set another fast lap and, as the timing board lights up with fast sectors all round, my position drops to 17th. 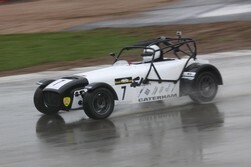 Every BookaTrack.com Caterham Superlight R300 Championship race is a double-header and the first of the two races is scheduled for the end of the first day; unfortunately those dark grey clouds are gathering again. As the whole of the Caterham grid stare up at the sky trying to guess what is coming, the clouds pre-empt all guess work and stream down what looks more than a shower. There is no question: this is going to be a very wet race as we head out onto the grid and the warm-up lap. As a racing driver, much as with other far more dangerous professions, you do what you do by thinking that major accidents happen to someone else. Doing close to 130mph down Hangar Straight in driving rain into a wall of spray, you can therefore keep your foot flat on the accelerator. But these conditions are like driving at top speed in the worse fog you have seen, and my "happens to someone else" attitude is beginning to waiver. The Caterham underneath me, though, is behaving impeccably and, despite not having time to set it up for these conditions, the car seems predictable and responsive. But wet race tracks are always ready to catch out the unwary. Heading down the pit straight, changing from 5th to 6th, the car snaps towards the wall as a wheel catches a puddle, but I quickly catch it - as I do with my breath. Approaching Becketts on the third lap I just catch a glimpse of a yellow flag through the mist and come straight on a multi-car pile-up. As I dodge in and out of bodywork and suspension bits scattered loosely over the track I can't help but think that a red flag is inevitable. Sure enough, the race is stopped, but a check-up in the medical suite for two drivers gives everyone a clean bill of health - these really are sturdy little cars. Unfortunately, with conditions worsening and light fading the race is abandoned for the weekend. Race two the next day is much brighter and no wet weather is to be seen. I have had a night's sleep to think about the race and, after the smash from the previous day, my grid slot has moved north two positions and I start 15th. 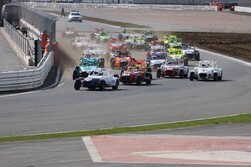 Race Plan 'A' is to get to 10th after the first lap, join the lead battle and tussle up to victory. Easy. Plan 'A' is working well as the first lap nears the end and a swift out-brake into Abbey secures 10th place. Charging through Bridge trying to close on the next victim I brake into Priory, but slightly off line and the dreaded narrow racing line comes back to bite me. The previous race was the 750bhp V12 Superleague Formula and their huge slicks have deposited enough marbles to keep Hamleys stocked for years to come. Gently slipping wide I'm retaken and the lead battle moves away. 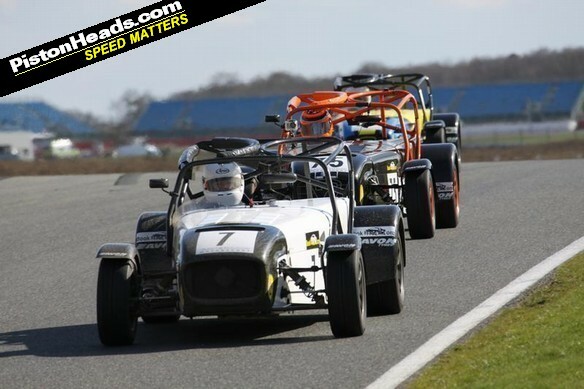 Using the slipstreaming effect of the Caterham I gather my composure and, onto the main straight I manage to get alongside and claw back 10th place. This time I'm determined to keep it. 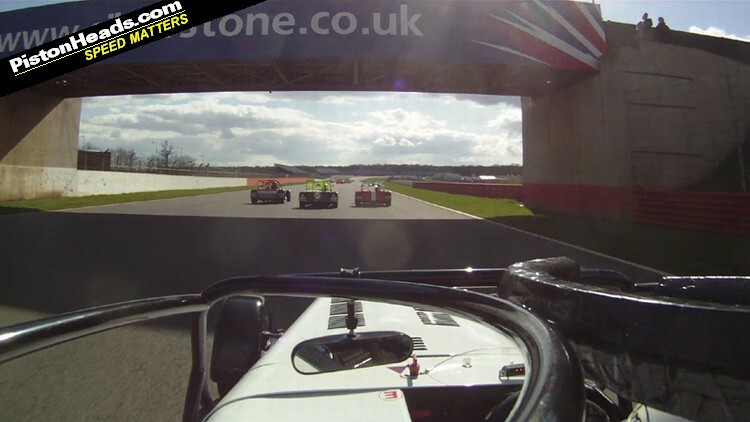 So I accelerate early through Copse in an attempt to break the tow I'm giving to 11th place. But this means I carry too much speed and drift wide onto the still-damp grasscrete. 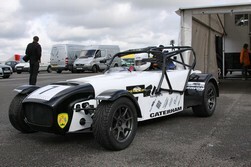 The good and bad thing about Caterham racing is one mistake is severely punished by your fellow competitors. Two cars fly past and my chance to battle to victory is gone. Being in a mid-table scrap is still a lot of fun though. My competitive spirit wants me to win, but getting one over any car around you is still massively smile-inducing. Even though the grid size for this year has doubled from my last race the competitors are still incredibly gentlemanly (oh, and ladylike - let us not forget the female competitors). As the race nears the end of its 30-minute duration, and even though my arms suggest to me that some time down the gym may have been needed before the race in preparation, I find I have thoroughly enjoyed the experience. Doing close to 130mph down Hangar Straight in driving rain into a wall of spray, you can therefore keep your foot flat on the accelerator. Sounds fun - that photo in the wet conditions looks nice too. 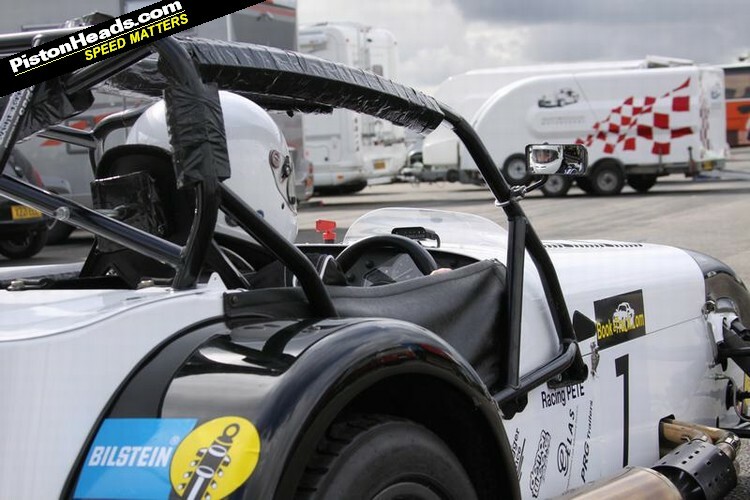 Nice write up Pete, gotta say Race 1 was something else. Hanger was insane. "after the bit about how to use 'for sure' in interviews"
james nice garage mate, any chance of some pics? Interesting comment about switching the front wheels so the tyres are facing the other way in the wet compared to the dry. How much of a difference does it actually make in the dry, having the tread facing the 'wrong' way compared to the right way? Are they on Avon CR500s?